Do you want to see how the drive to living a comfortable retirement is easier than you think? Buy this book to learn: Hey! What's My Number? reveals a four-step process that gives you a clear, easy-to-understand road map to that comfortable retirement. It features a never-before-seen Hey! What's My Number? "Retirement Readiness" calculator that acts like a check engine light for your retirement savings vehicle. Several advantages set this free web-based tool apart from the many "retirement" calculator clones every broker insists you use. For example, the only data you need is already at your fingertips. You don't have to guess how long you expect to live (no one really knows that anyway). You don't have to guess the future direction of key economic data like inflation, market returns, and the nation's GDP (not even professionals can do this). Most satisfying to many, you also don't have to guess what you'll spend when you retire (although you could if you want - yes, the calculator is that flexible). Best of all, the Hey! 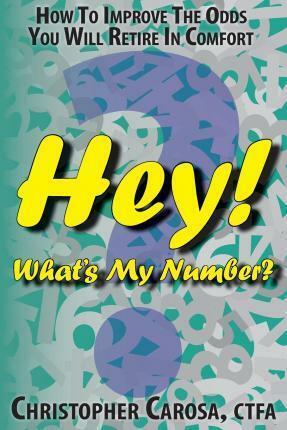 What's My Number? "Retirement Readiness" calculator automatically tells you the one number you want and need to know. It's your "Goal-Oriented Target" (or "GOT"). Discovering your own personal GOT allows you to see what you will need to earn each year on your retirement savings. You can take that number and, working either independently or with your financial adviser, determine how to invest your savings to achieve that GOT. Of course, your GOT is not written in stone. You can take actions to change it. Hey! What's My Number? shows you how to do that. (See, I told you the Hey! What's My Number? "Retirement Readiness" calculator was flexible!) While not ignoring the essential first steps, Hey! What's My Number? takes you well beyond these. It demonstrates how many have used their 401k as the vehicle to carry them to retirement happiness. Experience the wisdom and insights of dozens of the leading retirement service professionals from all across the country and explore how you can retire in comfort. Along the Journey, You'll Uncover What Drives a 401k to Work So Well: - 4 Steps That Will Change Your Life - How to Retire a Millionaire (Hint: It's Easier Than You Think) - 7 Simple Saving Secrets Every 401k Saver Should Know - 10 "Don't"s of 401k Savings - The Retirement Saver's Secret Weapon - The 401k "Benefits" That Can Hurt Your Retirement Readiness - The Three Most Common "Over"-reach Mistakes of Retirement Savers - 3 (Bad) Reasons 401k Savers are Over-Cautious - The 2 Least Understood Investment Rules that Most Harm 401k Savers - Revealed: The Three 401k Strategies More Important than Your Investment Selection - The Secret to Retirement Success - A Warning to All Retirement Savers - Detecting These Signs Can Help 401k Investors Avoid a Fall - Why Everyday People Hate and Mistrust the Financial Services Industry - "Peril" - the new "Risk" - The New Way: Goal-Oriented Targeting - How Does Goal-Oriented Targeting Work? - Are You Ready to Retire? - Your Key Personal Data - How to Assess Your Personal GOT - 5 Things to Do to Improve Your GOT Depressed because your investment returns have lagged? When you buy my book, you'll find this matters less than you think and, much to your delight, you'll unearth the simple way to overcome this apparent shortfall. You might recognize Christopher Carosa as the oft-quoted President of the Bullfinch Fund and its investment adviser Carosa Stanton Asset Management, LLC. A popular and entertaining nationally recognized speaker from coast to coast, he has appeared in, among other media outlets, The New York Times, Barron's, CNN and Fox Business News. Mr. Carosa was born in Buffalo and grew up in Hamburg, NY before moving to Chili, NY at age ten. He is a well-known promoter of the Greater Western New York region and also recognized as the local author of the book 50 Hidden Gems of Greater Western New York (Pandamensional Solutions, 2012) of which he's spoken about to many area service clubs and organizations. He's the first graduate from Gates-Chili High School to attend Yale University. Mr. Carosa has also been a top rated AM disc jockey, at one time was declared one of Rochester's "Most Eligible Bachelors," has climbed to the top of two volcanoes (including Mt. Vesuvius), once earned a national prize for his academic research, has seen a stage play he's written (The Macaroni Kid) performed to sold out audiences, and generally has had a pretty good life. Along the way Mr. Carosa has also been a successful serial, some say parallel, entrepreneur. He's created a market research company, a weekly suburban newspaper, a trust company, a mutual fund, and a national media company. Although he does have an MBA from the University of Rochester's prestigious Simon School, Mr. Carosa says he did so only to be able to tell people he didn't need an MBA to be successful in business. In fact, he claims everything he ever learned about business he learned by working in his grandparents' pizza stand at the Erie County Fair. Mr. Carosa has written five other books: A Pizza The Action (2014); 50 Hidden Gems of Greater Western New York (2012); 401 Fiduciary Solutions (2012); A Life Full of Wonder (2005 - unpublished); and, Due Diligence (1999). In addition to other publications, he has written more than 500 articles for FiduciaryNews.com. If you'd like to read more by Mr. Carosa, feel free to browse his author's site, ChrisCarosa.com; LifetimeDreamGuide.com, a site to another book he's working on. Mr. Carosa lives in Mendon, NY with his wife, Betsy, three children, Cesidia, Catarina, and Peter, and their beagle, Wally.